"We don't just sit and watch the advancing digital world around us. We move with it." 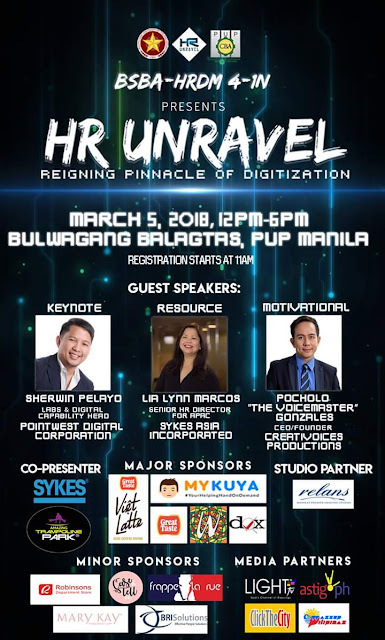 Happening on the 5th of March at the Bulwagang Balagtas, NALLRC Building, PUP Sta. Mesa Campus. Take notes and learn from our speakers from their respective fields and way of life as they share their knowledge, expertise and experience. Connect with your fellow delegates and to our corporate partners by visiting their booths and participating to the activities. To be hosted by Jom Nicole Berja and Jacob Fontiveros Cueva! WITTY WILL SAVE THE WORLD CO.
Be equipped. Aim the peak. Choose to unravel.